In a night that saw nine Scout FTR750’s compete in the Main, Indian Motorcycle Racing’s Championship-winning race bike swept the podium at the Calistoga Half-Mile. 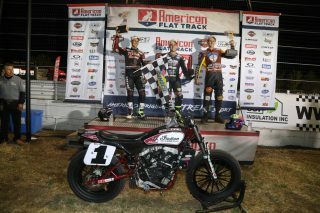 Reigning 2017 American Flat Track (AFT) Champion Jared Mees edged out Roof Systems/Indian Motorcycle of Metro Milwaukee privateer Jeffrey Carver Jr. for his second consecutive first-place finish. Nila Racing/Columbia Avionics privateer Kenny Coolbeth Jr. placed third.